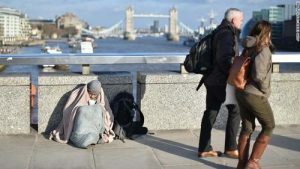 ER Editor: We also recommend this Observer report titled The Observer view on the shameful rise in rough sleepers, which makes the valuable point that ‘political oxygen’ is getting used up on Brexit, allowing this critical issue to disappear from view. Which is highly convenient for the Tory government, historically branded the Nasty Party for very good reason. The latest report from housing charity Shelter has revealed a further rise in the number of people recorded as homeless in Britain. In 2016, the first year the Shelter reported figures, there were thought to be 295,000 homeless people in the country. As Statista’s Martin Armstrong notes, that figure rose to 307,000 last year and has now reached 320,000. The figure takes into account people sleeping rough, living in temporary accommodation and the number of hostel places that are taken up. The totals are said to be conservative estimates and fail to account for people unknown to authorities. But it’s not just the homeless that are suffering, as The Guardian reports, food banks in some of the poorest areas are preparing for a big rise in demand when universal credit is rolled out by calling for more donations and volunteers, and stockpiling essential supplies.